Mondays, do they ever get easier? I hope you all had a great weekend and a Monday that sped by. I was kept busy at work so that definitely makes the day go by quicker. I don't think I need another introduction to Born Pretty Store, the online one stop shoppe for nail art. 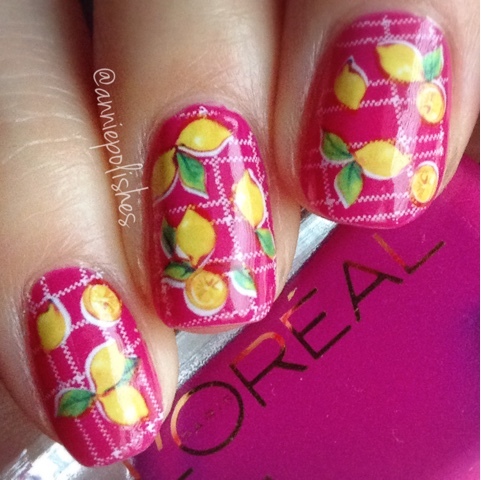 For today's post I have their Lemon Water Decals (item #21560) to share with you all. As I've mentioned before, water decals are probably my favourite type of nail art. They're so forgiving and easy to apply, plus they're so detailed with the little dainty designs. 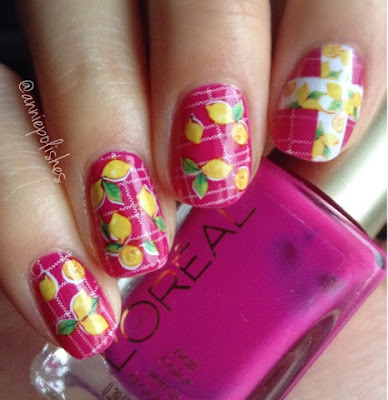 I picked out these lemon water decals because I couldn't resist how small and cute they looked. They're originally $2.50USD but currently are marked down to $1.50USD which is a great deal considering how many decals there are on the sheet. Below is a the product image from the Born Pretty Store site and they've included some design ideas what you could use with the decals, some of the designs are really cute and I may have to recreate them in the future. Here is what I created using the water decals. Overall, I thought these decals were easy to use and a size. However if you're trying to cut out a specific design you would need some pretty fine scissors and a careful hand as they are placed quite close to each other.